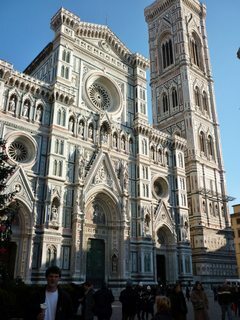 We finally, finally got to Florence. I would tell you about Milan, ecxept that nothing really happened there except a night in an Escher-esque hostel and some pretty amazing pizza, followed by yet another dash for yet another train. I have, in fact, been to Florence before. It's strange to be back. It's strange to be wearing t-shirts instead of scarves. It's strange to be with friends instead of family. It's strange to be not- quite-familiar, but not-quite-foreign. It's strange to want to see the same things you saw last time, but with new people. It's strange to stand in a queue for something you were able to just walk into last time. It's strange to arrive into a train station you swore you never wanted to see again in your life. It's strange to have a totally different reaction to the same place. 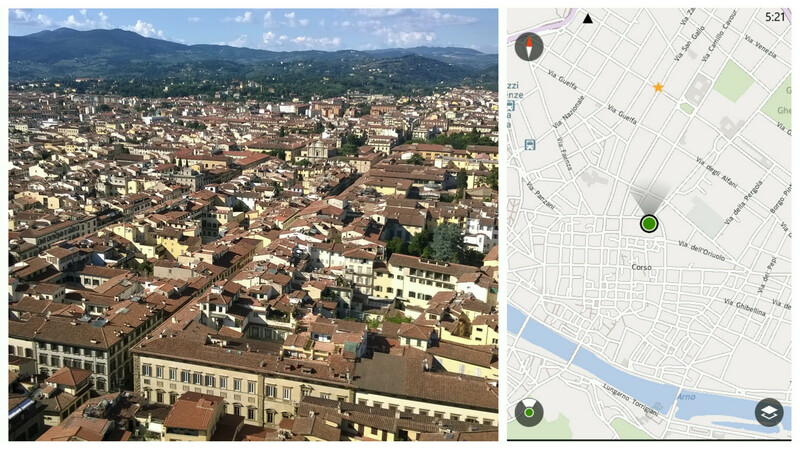 I took the opportunity to re-enact a photo from my first time in Florence while I'm here. Although admittedly, it was mostly an excuse to have another gelato. I really love Italy, and I think it's the food that does it. Food is pretty high up on my list of cultural stuff to appreciate, and despite a brief dalliance with Thai, I think I can safely say that Italian has always been my favourite food. 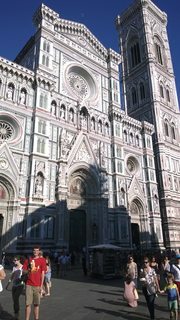 And while Florence is a really, really beautiful city, possibly one of my favourite cities in the world, I've been here before. 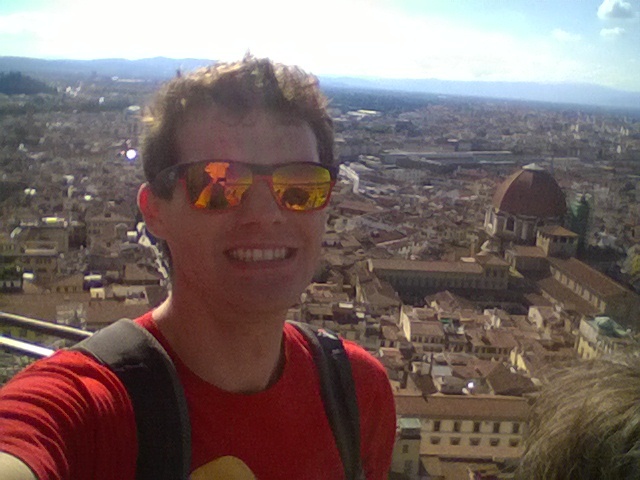 I have climbed the Duomo, I have seen the David, and I have seen the Ponte Vecchio. My travelling companions have not, though, and while I could and maybe should go and find some new and interesting stuff, they haven't done the basics yet, and so I get to see the basics again too. It's cool though. I am looking at this mostly as a chance to relax a little bit, without trying to take in every single detail. That, and eat a lot of gelato. Plus, I get to pretend to be an expert, which is always fun. The podcasts about Brunelleschi's dome I listened to in 2010 make me sound super knowledgeable about that, for example. Sometimes I wonder if maybe I should be a tour guide. I mean, I basically sort of am? Hmm. Technology has moved on a bit since 2010. For example, Audioguides are much more common now, whereas the first time I was here I had to download my own as podcasts before I got there. There's also free WiFi pretty much across the city, which I wouldn't have noticed before anyway because my phone was crap, but more likely didn't actually exist. We bought tickets to the dome while standing in the queue, and then scanned a phone screen to get in. Four years ago that was science fiction-level, or at least wanky businessman-level, and certainly not student backpacker-level. It also gave us the novelty of being able to fairly accurately spot our apartment from the top of the dome. That was pretty cool. 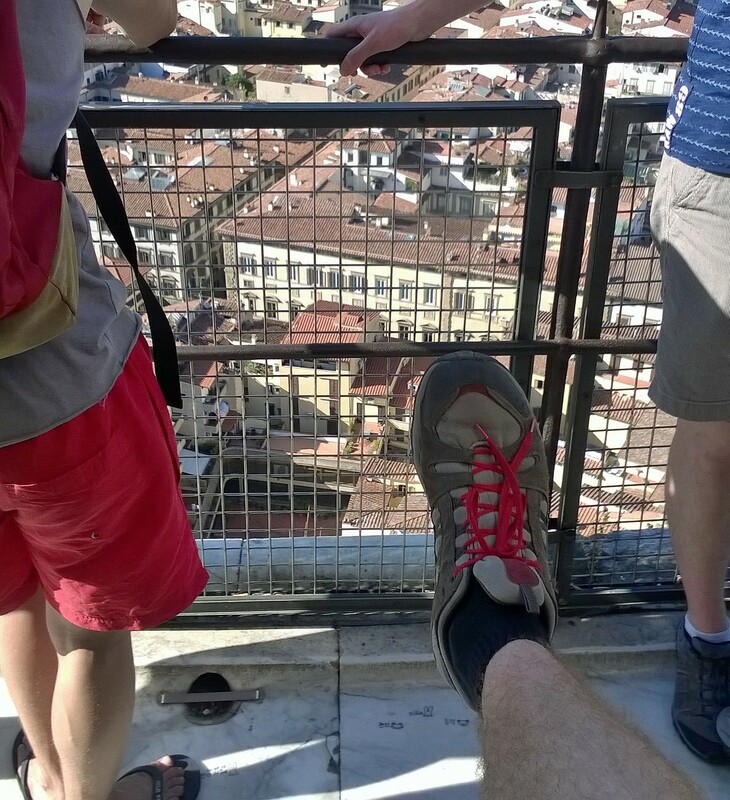 This also marks the second time this pair of shoes has done the 300-odd steps to the top of the Duomo, which considering they are 4 years old, is quite the achievement. We went out for Steak Fiorentina for dinner. 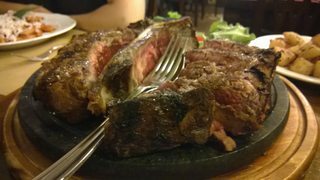 I can't remember whether I did that with Dad or not, but in a hitherto unseen fit of manliness the three guys declared that tonight we would dine on steak, and proceded to order a kilogram of the stuff for about forty euros. I am not usually a rare steak guy, and steak fiorentina is a very rare style, and this was very rare steak - but it was also incredibly good steak. It was a little intimidating to start off with, but once we got going we kind of wished we'd ordered more. I'm not sure I would have it every night, but I'm glad we got it once. Tomorrow, we're taking the train to Venice for the day, and I'm bothering to say this because I think this marks the first, and very possibly last, time since I left that this blog is actually up to date. Venice is gonna be awesome, and I am psyched. Not that Florence wasn't. It is amazing, and there is so much cool stuff here (capital of the renaissance, doncha know), and coming here twice makes me want to come again more next time I go to Europe, rather than less. It's a nice chance to decompress, and get some blogging out of the way, and acting like I own the place is quite a lot of fun. Revisiting cities - pretty cool, would do again. Grandma is loving your writing, as am I.